Project 2016 allows you to customize the Gantt chart in several ways. Taskbars are the horizontal boxes that represent the timing of tasks in the Chart pane of Gantt Chart view. You can format a bar individually, change the formatting settings on different types of taskbars, or apply a new style that controls bar formatting on the entire chart. The shape that appears at the start and end of the bar: The ends can be formatted with different shapes, such as arrows and triangles. The shape, pattern, and color of the middle of the bar: You can change the shape’s type and color. The text that you can set to appear in five locations around the bar (to the left or right of the bar or above, below, or inside it): You can include text in any or all of these locations; just don’t add so many text items that they become impossible to read. As a rule, use only enough text to help readers of the plan identify information, especially on printouts of large schedules where a task may appear far to the right of the Task Name column that identifies it by name in the sheet area. When you track progress on a task, a progress bar is superimposed on the taskbar. You can format the shape, pattern, and color of the progress bar. The goal is to contrast the progress bar with the baseline taskbar so that you can see both clearly. By formatting taskbars, you can help readers of the plan identify various elements, such as progress or milestones. If you make changes to individual taskbars, people who are accustomed to the standard formatting in Project may have trouble reading the plan. In other words, don’t get carried away. From the Format tab, select Format in the Bar Styles group and then choose Bar Styles. The Bar Styles dialog box appears, as shown. On the spreadsheet, along the top in the Name column, select the type of task that you want to modify (Split, Progress, or Milestone, for example). To modify the styles used for all summary tasks, for example, select Summary. The choices on the Bars tab in the bottom half of the dialog box change based on the selected task type. 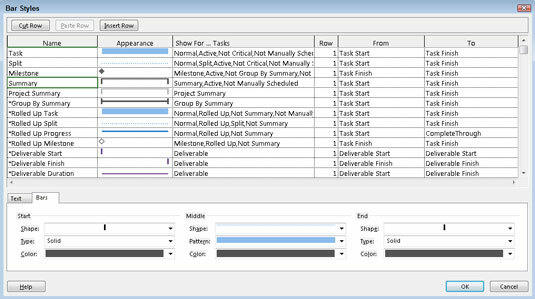 Click in the Show For Tasks column for the task type you want to modify and then select criteria for the task, such as Critical or Finished, from the drop-down list that appears. Shape: Modify the shape of either end or the middle of the taskbar. 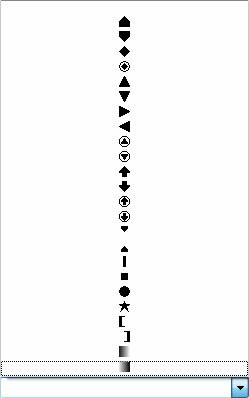 Shapes on either end may be any one of 24 shapes (as shown here), though you may commonly see an arrow, a diamond, or a circle. The shape in the middle consists of a bar of a certain width. Color: Modify the color used on either end or in the middle of the taskbar. Project now enables you to choose among various theme colors (as in the other Office applications). Type: Modify the type of formatting for the shape on either end of the taskbar. This setting controls how the shape is outlined: framed with a solid line, surrounded by a dashed line, or filled in with a solid color. Pattern: Select another pattern for the middle of the bar. Click any text location. An arrow appears at the end of that line. Click the down arrow to display an alphabetical list of possible data fields to include and then click a field name to select it. Repeat Steps 5.1 and 5.2 to choose additional text locations. 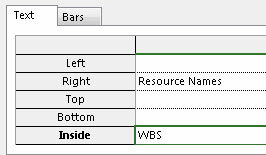 The figure shows how resource names are selected for the right side of the bar and how the WBS is selected inside the bar. Add text to as many as five locations in and around taskbars. Click the OK button to accept all new taskbar settings. If you want to make the same types of changes to an individual taskbar rather than to all taskbars of a certain type, right-click the taskbar and choose the Format Bar option. The Format Bar dialog box appears, offering the same Text and Bars tabs found in the Bar Styles dialog box, without the options at the top to select the type of item to format.